New immunotherapy drug (anti PD-1anti-body therapy) works differently from previous immunotherapy drugs. In Premiere Clinic, many patients, especially those with squamous cell lung cancer, achieved better results than with chemo therapy and we are amazed by this remarkable immunotherapy. Immune cells have PD-1 which prevents overstimulated immune response. Cancer cell use this when uncontrolled immune cells attack them. When immune cells attack cancer cells they use PD-1 and control the immune cells. We call PD-1 an Immune checkpoint. 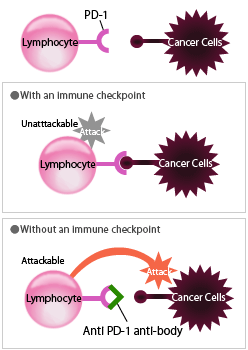 Without this immune checkpoint, for example, not using anti PD-1 antibody would allow immune cells to attack cancer cells without any control. Anti PD-1 anti-body makes immune cells work efficiently without resistance by cancer cell’s. It would produce a better result if it is done with ‘specific immune cell therapy’ rather than independently. Dendritic cells with peptide vaccination attack specific lymphocytes that, when stimulated, attach to cancer cells providing the vaccination to the cancer cells. Then the immune cells in the body attack the cancer cell directly. It is the ideal cancer therapy for spontaneous recovery that we have. Anti PD-1 anti-body, anti CTLA-4 anti-body and anti Treg anti-body are excellent but also have side effects. It is auto immune diseases mainly which might cause inflammation in the lungs, thyroid, liver, pancreas et al. So patients need to check their body regularly and we discuss this with patients and their family. Anti PD-1 anti-body creates a new therapy which controls the immune response and works efficiently without being resisted by cancer cells. Also new powerful peptide vaccination plays a key role in curing various cancers. We live in a hopeful age when many therapies like these are being developed.